54 THE SHOP NOVEMBER 2018 W hile Joe Cassity says his orga- nizational skills are a work in progress, the success of his after- market accessories shop surely proves him wrong. 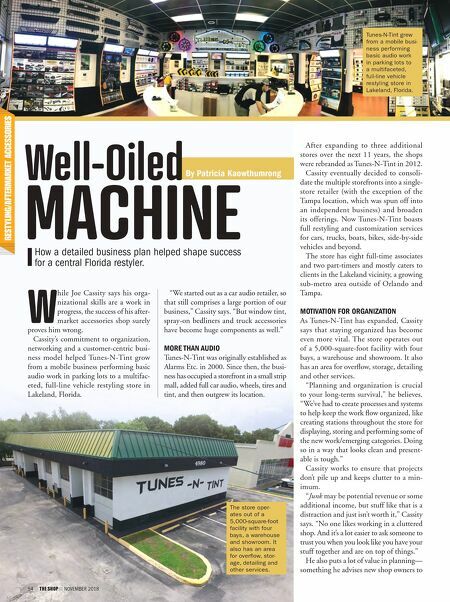 Cassity's commitment to organization, networking and a customer-centric busi- ness model helped Tunes-N-Tint grow from a mobile business performing basic audio work in parking lots to a multifac- eted, full-line vehicle restyling store in Lakeland, Florida. "We started out as a car audio retailer, so that still comprises a large portion of our business," Cassity says. "But window tint, spray-on bedliners and truck accessories have become huge components as well." MORE THAN AUDIO Tunes-N-Tint was originally established as Alarms Etc. in 2000. Since then, the busi- ness has occupied a storefront in a small strip mall, added full car audio, wheels, tires and tint, and then outgrew its location. After expanding to three additional stores over the next 11 years, the shops were rebranded as Tunes-N-Tint in 2012. Cassity eventually decided to consoli- date the multiple storefronts into a single- store retailer (with the exception of the Tampa location, which was spun off into an independent business) and broaden its offerings. Now Tunes-N-Tint boasts full restyling and customization services for cars, trucks, boats, bikes, side-by-side vehicles and beyond. The store has eight full-time associates and two part-timers and mostly caters to clients in the Lakeland vicinity, a growing sub-metro area outside of Orlando and Tampa. MOTIVATION FOR ORGANIZATION As Tunes-N-Tint has expanded, Cassity says that staying organized has become even more vital. 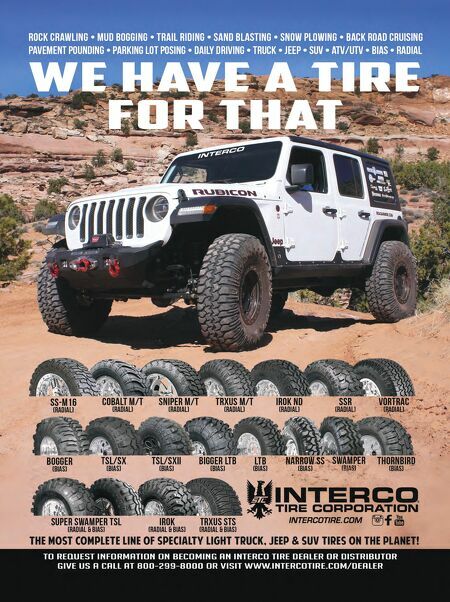 The store operates out of a 5,000-square-foot facility with four bays, a warehouse and showroom. It also has an area for overflow, storage, detailing and other services. "Planning and organization is crucial to your long-term survival," he believes. "We've had to create processes and systems to help keep the work flow organized, like creating stations throughout the store for displaying, storing and performing some of the new work/emerging categories. Doing so in a way that looks clean and present- able is tough." Cassity works to ensure that projects don't pile up and keeps clutter to a min- imum. "Junk may be potential revenue or some additional income, but stuff like that is a distraction and just isn't worth it," Cassity says. "No one likes working in a cluttered shop. And it's a lot easier to ask someone to trust you when you look like you have your stuff together and are on top of things." He also puts a lot of value in planning— something he advises new shop owners to 54 THE SHOP NOVEMBER 2018 How a detailed business plan helped shape success for a central Florida restyler. Well-Oiled MACHINE By Patricia Kaowthumrong Tunes-N-Tint grew from a mobile busi- ness performing basic audio work in parking lots to a multifaceted, full-line vehicle restyling store in Lakeland, Florida. The store oper- ates out of a 5,000-square-foot facility with four bays, a warehouse and showroom. It also has an area for overflow, stor- age, detailing and other services.